If you are searching for an amazing Kung Fu training in China with a master from a Shaolin Temple, join Yu Kung Fu Martial Arts Academy in Shandong Province, China. Headmaster Yu ZhiChao, the founder of the academy, has begun to expand his teaching experience to foreign students. Refresh previous training, learn something new, or start with the basics to kick start your martial arts experience! During this training, you will stay in a shared room. The student accommodation building is located within the school grounds. With single and double student bedrooms, a dining room, bathrooms with hot showers and western toilets, and common room with Wi-Fi, the accommodation offers comfort and peace outside of training hours. To help everyone feel comfortable when they arrive, each student, no matter the length of their stay, will receive a student starter kit with everything they need to settle in including toiletries, linen, an uniform, a water bottle, laundry powder, shower slippers, and prayer beads. During this training, you will be able to choose your own focus or participate in all classes on offer. You may focus on Shaolin Kung Fu basics or acrobatics, try out Sanda kickboxing and sparring, or focus on the internal side of Taichi, Qigong, and meditation. You will train in the mornings and afternoons and relax on the weekend where you can take a quick trip to a nearby city and indulge in the many flavors of local Chinese food. Shaolin Kung Fu, also known as Shaolin Quan or Shaolin Fist, is one of the oldest forms of Chinese martial arts, originating in the Buddhist Shaolin Temple in Henan Province. Dating back over 1500 years, Shaolin Kung Fu developed, amongst other reasons, so the monks could protect themselves and the monastery from harm. Basics: For stamina, flexibility, balance, strength, and coordination. Exercises such as kicks, punches, and stances are practiced repeatedly. Combat skills: Various routines involving combat forms (taolu) and their empty-handed and weapons methods. Power skills: Involving internal and external power and energy. To this day, Shaolin Kung Fu is still practiced within the temple but its fame has seen its students and followers spread into schools throughout China and the rest of the world. Modern times have also seen its incorporation into the popular martial arts sport often called sports Wushu. For many martial artists, these Wushu competitions provide the best opportunity for them to test their skill and expand their knowledge of what is possible. Sanda’s combination of fighting techniques include wrestling, takedowns, punches, kicks, sweeps, and much more despite its western classification as kickboxing. In fact, the literal translation for Sanda is "free fighting". Power stretching involves extreme stretching exercises used by the Shaolin monks to reach maximum flexibility. Several techniques and positions are used to help gain this flexibility, such as partner stretching and Proprioceptive Neuromuscular Facilitation stretching (PNF), which is a push and relax system. You will learn to push your body to its limit while remaining focused and relaxed. In turn, your body will feel more limber, give you a quicker recovery from strength training and overall feel better during other day-to-day exercises. This weekly training schedule may have small changes occurring during severe weather. There may also be schedule changes during events, competitions, and workshops held by the school. No prior martial arts experience is necessary for students applying for the standard martial arts course. It is worth noting that in the near future places within the school may be limited to experienced or long-term students only. This training will take place at the Yu Kung Fu Martial Arts Academy in Shandong Province, China. The school is located in the headmaster’s birthplace, a small village outside Tengzhou City in Shandong Province. It stands on the very edge of the town with forests and open farming land extending for kilometers. The village itself is filled with a traditional Chinese community of friendly families and high-walled houses. The walls are covered in paintings and tiled murals depicting sacred mountains and waterfalls. 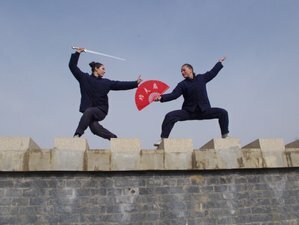 The school is located only 30 minutes from the bustling Tengzhou City, which has all the amusements and supplies necessary for outside of training. There is also a shop within the school which can provide anything else a student will need for training, such as shoes, personal weapons, and clothes. During this training, you will enjoy three daily traditional meals. The meals will be Chinese-style share dishes including a variety of vegetables, tofu, sprouts, eggs, meat, rice, soup, noodles, and bread. All meals are provided in the dining room with coffee and tea served with breakfast. All dietary requirements can be met by the cook. After training, during your time off you are free to explore the village and farmland, travel to the nearby cities like Tengzhou and Zaozhuang. Exploring China during your visit is recommended so you may make the most of your experience abroad. The only condition is that you must advise the school of your travel plans beforehand. Only a few minutes walk from the school are a few small restaurants, shops and a big lake for swimming. In the city of Tengzhou, there is any of the restaurants, activities, and sights you would find in a large Chinese city. You may take ride bikes to the lake or shop, rejuvenate with a massage in the city, and visit the beautiful park and museums.